Delight in every bite! Beginning May 27 till June 24, guests can break fast and enjoy a myriad of kampung style dishes along with Melting Pot’s all time favourites. Let the feasting begin! Aptly themed ‘Cuit-Cuit Rasa’, we have chefs sharing their own and their family recipes. Guests can savour their favourite Ramadan delights, browse through Chef’s specialities. This year’s new addition to the local fare include gulai urat belimbing buluh, gulai rusa dengan ubi kayu, rendang nangka muda, ayam kampung masak merah berkerisik, udang galah sambal giling dengan terung pipit, ikan cencaru sumbat sambal kelapa and Concorde laksa, steamed black mussel with creamy tarragon and few others. Other kampung style dishes featured in the menu which were popular in the past include bubur lambuk, sup gearbox tulang rawan, roasted whole lamb with the finest herbs and spices with special briyani rice, kari kepala ikan Penang, siput sedut masak lemak pucuk muda, asam pedas ekor lembu, pajeri nenas, puyuh goreng berempah, pais udang dengan serunding kelapa, daging masak merah, paru goreng berjintan, sambal tumis udang dengan petai and more. Apart from traditional delicacies, savour delicious chicken pratel, lamb kurma with potato, butter prawn with salted egg, steamed whole fish with tom yam sauce, steamed black mussel with creamy tarragon. The teppanyaki station has always been the crowd’s favourite. One will not miss out to have a plate or two of teppan. Choose any assorted fish, beef or seafood and chef cook it a la minute. For desserts, sample some onde onde (kuih buah Melaka) and lempeng pisang made on the spot. Traditional kuih tepung talam, tepung pelita, bingka ubi, kole kacang, seri muka and kuih tako are must-haves for breaking of fast. Do not miss bread and butter pudding, pengat durian with pulut, assorted French pastries and specialty cakes. There are four daily rotation menus. To complement the buffet, resident strollers Begema 5 will serenade diners with soothing music all night long (performance begins at 8.00 pm). A special buffet supper spread awaits… For those who wish to have their ‘sahur’ (pre-dawn meal), swing by for some good food. 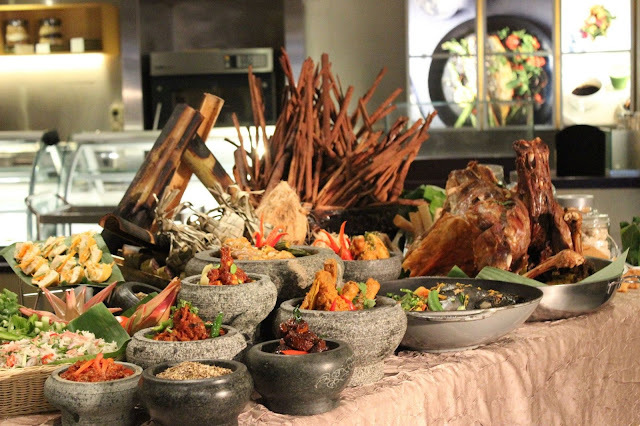 The buffet which starts from 11.00 pm till 5.00 am offers local favourites like bubur lambuk, mee mamak, nasi lemak, teochew porridge, roti canai, sandwiches with various fillings, pengat durian special and more. Buffet supper is priced at RM80.00 nett per person. For reservations, call Melting Pot directly at 2717 2233 (direct line). Any enquiries for private events, do email to [email protected].